Fire closures on the PCT combined with heavy snow accumulation earned 2017 the nickname "The Year of Fire and Ice," and in 2018 with lighter snow, we had at least as much trouble with fire closures, including closures in the symbolic section between Hart's Pass and the Northern Monument. Many times hikers had to detour off of the official PCT route, usually following signs, but occasionally getting off course. Guthooks, the most popular map application on the trail in 2017 and 2018, often did not cover the detour routes. What can you do? In addition to talking with other hikers, check the PCT trail closures every time you get into town to see if something has been announced, and if warnings have been posted, usually when a closure seems imminent. Next, study the closure and alternates, possibly downloading the closure details to your phone. Do I need to say this? Never Hike a Closure. It's hard for me imagine a more disrespectful violation of trail etiquette. 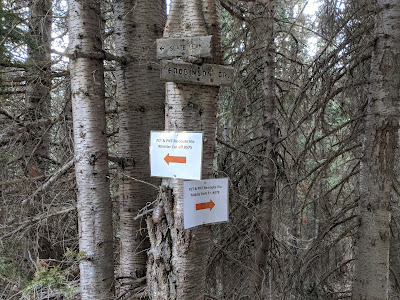 The PCTA, volunteers, and land managers are working hard to keep the trail safe and open, and you are abusing the trail and these people when you hike a closure. Regardless of your own judgement, hiking a trail that has been damaged almost always causes additional erosion and increases the effort to bring the trail back up to standard. Next, consider locating a paper map, or download digital maps that cover the closure route. Digital maps show you the trails mentioned in the alternate route, elevation changes, major water sources and campgrounds, and can be especially valuable in the first few days of a closure announcement when signage may not be up yet. Viewed through a smartphone application, these maps will also pinpoint your location using the phone's GPS. Avenza is an easy-to-use map display app favored by the Forest Service that you can download free. Some maps are free on Avenza, but a fee of up to about $15 is more typical. Two digital map resources cover almost the entire trail in detail: the National Geographic Trails Illustrated Maps, which cover most of the PCT, and the Forest Service Visitor Maps for California, which fill in most of the gaps in the Trails Illustrated maps. In 2018 in the Goat Rocks Wilderness, I was happy to have a digital map of a nine mile detour. The map showed me exactly where I was on the detour, and helped me pick a great campsite. The next morning, two Forest Service rangers told me about another PCT hiker taking a wrong turn and ending up in their fire line just the day before. Also in 2018 I had downloaded the Trails Illustrated Map covering the Northern Cascades National Park and was able to see the entire Ross Lake detour. Camped in a smoky haze north of Stehekin, I opted to come back later, hoping that the trail from Rainy Pass to Manning Park would reopen, which it did, with a remaining detour. Some of my fellow hikers on tighter schedules, painstakingly transcribed information off of my map, even taking photos of my phone screen. That group did make it to the Canadian border via Ross Lake, but at least one of them was going to quit the trail before they were able to study the detailed map. Later, when I hiked passed Hart's Pass, I was happy to have a detailed map of the remaining detour, which again helped in picking a campsite, and helped sort out one trail junction where the PCT signage was missing. Hiking the PCT will be adventure enough without getting lost on a detour. Good luck and enjoy your hike.